Suspenseful, multi-layered quasi-thriller kept me on the edge of my seat for about two-thirds of the movie. In the House (aka Dans la maison) does lose momentum and the ending is a bit unsatisfying, but what an interesting movie! There is so much food for the thought here. 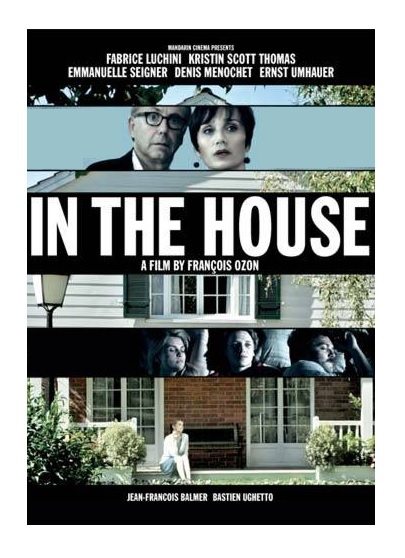 In the House was directed by François Ozon (Under the sand and Swimming Pool), who is known for his slow-burn dramas. In typical Ozon fashion, the story is painted with soft strokes. In an era of hyperactive cinema, it’s kinda brave to make a movie that is determined not to show its cards all at once. In the House deals with a variety of very interesting, topical issues. First, the movie explores ethics in academia. How far can a teacher go to encourage intellectual curiosity among his/her students? While well-intentioned, the teacher crosses the line more than a few times. “How far is too far?,” the film pointedly asks. The film also explores the power of narrative and the ethical obligation of storytellers. The student writes a series of essays based on his observations, but you are never sure how much is true and how much has been embellished by the student. Deliberate embellishment or subconscious biases? Director Ozon turns the issue around and invites the viewer to question him; is he too manipulating his audience? That’s why I found the movie cleverly meta. Fabrice Luchini, as the teacher, and especially newcomer Ernst Umhauer, as the student, are excellent! They play a sort of cat-and-mouse game that’s suspenseful and engaging. Kristin Scott Thomas (The English Patient) is also great as Luchini’s wife. In the House is marvelously imaginative, flaws and all! A great film for writers, teachers or anyone interested in pedagogy and/or writing. Color, 105 minutes, Rated PG. Such a smart, funny movie – which makes you feel smarter for watching it! Looks good! I want to see it now. Thanks, Eric. You are analytical and a graceful writer. I learn a lot from you. This is one of few Francois Ozon’s better known films I have not yet seen, but I am dying to. It is also quite a coincidence because only yesterday I compiled a list of three films by Ozon which I want to review together for my blog. I admire Ozon. I think the man has some peculiar cinematic vision.